Michelangelo’s iconic sculpture of David now stands in the Accademia Gallery in Florence, but that’s not where it was originally supposed to go. Before it was moved to the Accademia in 1873, it stood guard outside the Palazzo della Signoria, Florence’s city hall, for 370 years, but even that wasn’t where it was first meant to be. 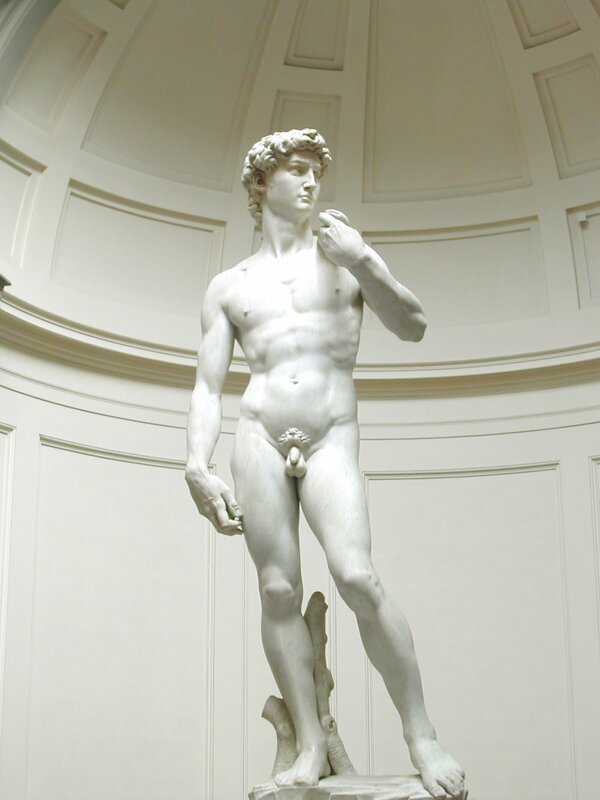 David’s history actually begins a hundred years before Michelangelo picked up the chisel. It was commissioned by the Overseers of the Office of Works (the Operai) of the Duomo, Florence’s cathedral church, as one of a dozen Old Testament-themed sculptures which would adorn the buttresses of the cathedral. Donatello made a Joshua out of terracotta for this project in 1410 (Joshua disappeared in the 18th century and has been lost ever since). It wasn’t until 1464 that the organization commissioned a David sculpture from Agostino di Duccio, a student of Donatello’s. They gave him a massive block of Carrara marble, but he made little progress and 10 years later another student of Donatello’s, Antonio Rossellino, was given the commission. He couldn’t hack it either (no pun intended), so the huge block of marble just sat on its side in the yard of the cathedral workshop, exposed to the elements, until finally in August of 1501, the Operai gave the job to the 26-year-old Michelangelo. It only took him just over 2 years to finish the 17-foot-tall statue. It was immediately recognized as a masterpiece, but now there was a whole new set of issues to wrestle over: how were they supposed to hoist 17 feet and 6.4 tons of marble up to the cathedral roof? 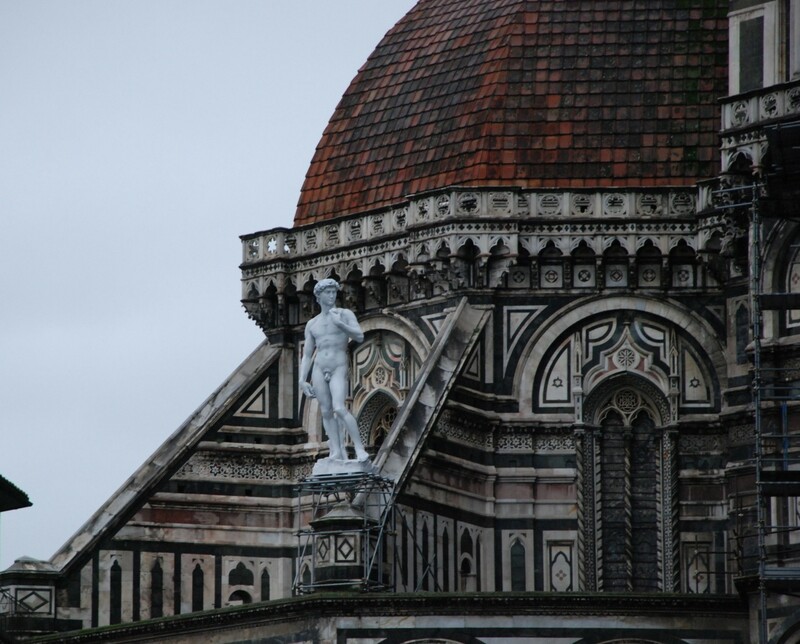 Also, given that the dozen Biblical figures thing never really panned out, was the roof of the Duomo really the best place for this symbol of the Florentine Republic and its scrappy struggle against the tyrants who had sought to conquer it? The Operai called a meeting in January 1504 of illustrious Florentine artists including Leonardo da Vinci, Sandro Botticelli, Andrea della Robbia and Perugino, among other luminaries, to determine where the David should be placed. Botticelli thought it should go somewhere on or around the cathedral, but most everyone else thought it should go somewhere in the Piazza della Signoria. The debate continued to rage for months, until finally the Operai decided on the spot in front of the entrance to the Palazzo della Signoria. After a 4 day procession, the David, carried through the city inside a wooden cage running on greased beams, was placed in its spot, powerful glare facing Rome. The installation is inaugural event of the Florens 2010 forum. 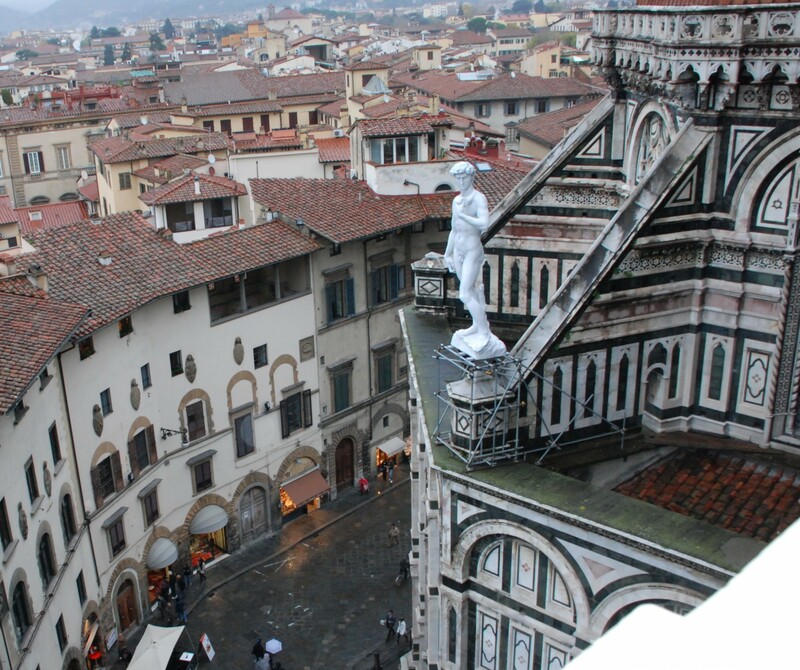 Over the course of the week, fiberglass David was moved to the other locations proposed during the 1504 debate, like the Duomo’s sagrato (the consecrated area in front of the cathedral) and the piazza next to the Duomo’s workshop where Michelangelo worked on the sculpture. This entry was posted on Friday, November 19th, 2010 at 11:07 PM	and is filed under Modern(ish), Renaissance. You can follow any responses to this entry through the RSS 2.0 feed. You can skip to the end and leave a response. Pinging is currently not allowed. I live in Florence, so I had the opportunity to see the fibreglass model of the David on the contrafforte (if you don’t mind, I think that I will avoid the word “buttress” in present company!) 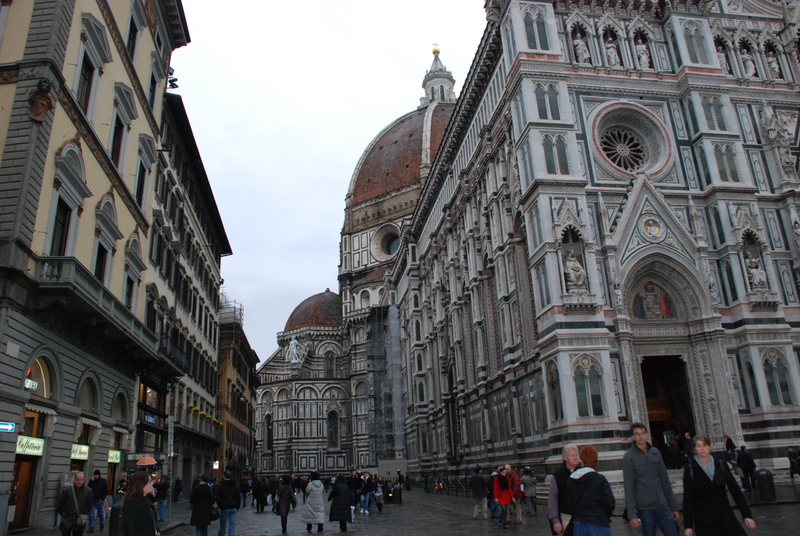 at the Duomo. It really was an epiphany for me, since the statue looked absolutely right up there and the composition fell into place (the bold turning of the body, the angle of the head, the seemingly oversized head and hands) as did the technique (especially the strong undercutting of the hair and other details). AND we were all reminded that it began life as “just another statue” before it became (ommigod!) MICHELANGELO’s DAVID! Sometime, maybe I will share my photographic collection of outrageous David-themed kitsch, collected over the years here in Florence! Let’s make a deal right here and now: when you share your collection of David kitsch, I will dedicate a blog entry to its sheer awesomeness. I don’t even need to see it first; that’s how sure I am that it is a marvel to behold. Speaking of marvels to behold, I’m amazed you could see details on the David from down on the ground. DEAL!!! But first, I have to run this by my brother, who is the Goldberg Court Photographer. Alas, he (and his camera) were back in the States when the David was perched “up there”… I don’t mean to say that you could count the hairs on David’s head in the fibreglass replica, but there was a remarkable sense of drama and clarity–with elements of strong detail contrasted against the smoothly rendered body. (Don’t blame me! We art historians often be talking that way. )Of course, with a work like (ommigod!) Michelangelo’s David, it is hard to be sure if one is seeing things or remembering things!